Hardly had the co-founders of Operatunity Daytime Concerts, Susan Boland and John Cameron returned after escorting musical tours in Russia, Germany, Prague and Netherlands, that they were back on stage, regaling the local audience at <ITALICS>The Golden Era of Musicals concert hosted at the St Columba Church in Botany. As always, the daytime concert on Tuesday had over 400 people enjoying music from another era where melody was king. Paying tribute to old artistes with musical gems that included Climb ev’ry mountain from Sound of Music, Get me to the Church on Time from My Fair Lady and Sunrise Sunset from Fiddler on the Roof— kept the audience delightfully engaged. Rising star Kelly Harris made her debut and performed a couple of numbers with Rory Nolan, a young and talented theatre enthusiasts and actor from Shortland Street. 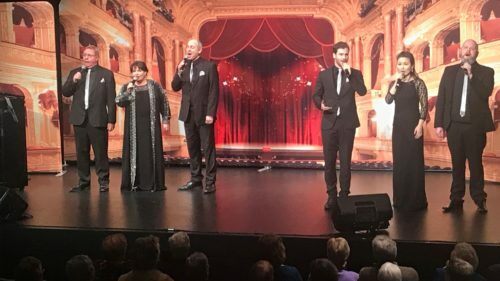 Also making their presence felt were more experienced musical specialists Stuart Coats, who has a long-standing involvement with New Zealand Opera, and Hamish McGregor who performed a delightful rendition of If I were a rich man. Adding a fun element to the show were two ladies from the audience, Wenona Stephens and her friend Shirley Yelavich, dressed in vintage regalia. 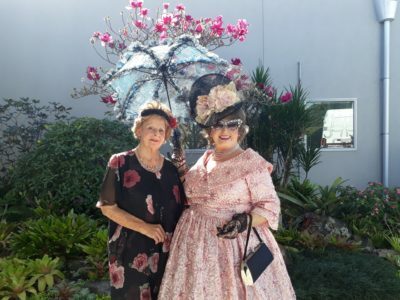 Wenona Stephens and her friend Shirley Yelavich dressed in vintage regalia at the Operatunity Daytime Concert `The Golden Era of Musicals’ hosted recently at St Columba Church. Times photo Farida Master. Much to everyone’s surprise, Wenona walked up on stage looking straight out of the golden era, just when the performers asked the audience to sing-a-long to Hello Dolly. It’s easy to see that both Susan and John, the couple who started Operatunity 17 years ago, still enjoy every bit of the showbiz including serving sandwiches after the show and talking to their audiences. The company now produces more than 200 concerts a year touring nationally to more than 25 venues around the country.